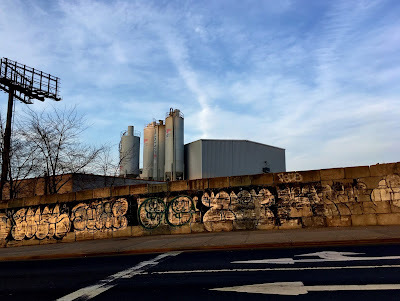 The rodent bait notices are up at 305 23rd Street, a sure sign of demolition on the way. Both 305 and next door 303 were sold earlier this month - 305 for $3.15M & 303 for $1.74M - to Manhattan-based 303 23rd Street Development LLC. The mortgage lender is Derby Senior Greenwood LLC, with the West 57th address of Derby Copeland Capital. No new building plans are currently on record. The lot at 303 is occupied by a one-story garage building. The building at 305 23rd is imposingly wide. It appears on an 1880 property map as a wooden, irregularly shaped dwelling straddling two lots (304/305), and at some point after 1916 it looks as if it was expanded, on what was then the 304 lot, to make it a regular, rectangular shape. If you look at the pitched roofline from across the street, you can get an idea of the building's original shape. The roofline suggests that though the building is faced in brick it may still be wooden underneath. I'd love to know how old it is, and if it was connected to the flourishing monument and florist businesses that operated around Green-Wood Cemetery in the nineteenth and twentieth centuries. A misty day at Dead Horse Bay. I went on a trip organized by The City Reliquary. The event was connected to the museum's NYC Trash! exhibition, which closes this weekend. We were lucky to have Robin Nagle with us on the trip. 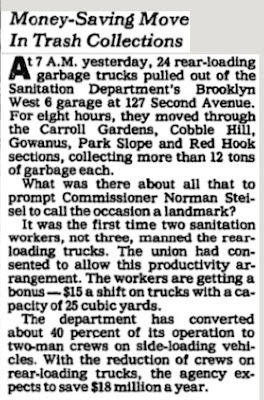 Nagle, author, academic & anthropologist-in-residence to the NYC Department of Sanitation, showed us around the bay, and explained the area's historical significance. In the mid-nineteenth to early twentieth century, the area was a noxious hub of rendering plants, incinerators, & fish-oil manufacturers, and most of the workers were residents of nearby Barren Island. Over time, these industries dwindled, and the waters of the bay were used as city garbage dumps. 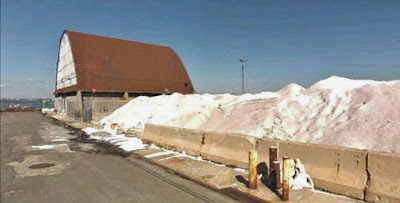 Barren Island became connected by landfill to the mainland in the creation of the city's first airport - Floyd Bennett Field. The last residents of Barren Island left by the 1940's. For decades, detritus from landfill, city dumping, and rendering industries has been making its way onto the shore. Year by year, day by day, tide by tide, it keeps on coming. At first sight it's the glass you notice - thousands of bottles, whole or in pieces - but as you look more closely, you'll see a range of domestic items, many of them dating from the 1950's. Consumer culture on the rise in every sense - a heyday of manufacturing irresponsibility. The kitschiest of the treasures make us smile. The pieces are affecting in other ways too. Whose lives are represented here, and what do these tokens tell us of their owners' labors and pleasures? A doll's head breaking through sand, a plastic alligator purse, cooking pans, nail polish, an endless supply of hosiery. Stockings clings to branches and debris like seaweed, drooping and ghostly, or swollen with sand, looking disconcertingly like limbs. Where the edge of the beach meets ridge of grassland, you can see the garbage layered underneath, waiting to disgorge itself. Sometimes there are signs of a deeper past, when the weathered bones of animals meet daylight. I'd been meaning to get down to Dead Horse Bay for years, and know I'll get back there under my own steam. The place is compelling. Many thanks to City Reliquary for putting on the tour, and to Robin Nagle for her expert guidance. I’ve been photographing First Communions, one of the three Catholic Initiation Sacraments, since 1971. One of my first ‘serious’ photographs depicts my Aunt Millie and her son John standing in the rain outside our parish church. John has just made his First Communion and is proudly holding his little prayer book wide open for me. Over the years I often returned to photograph at this church St. Michael the Archangel in Sunset Park (where I had made my First Communion), and to St. John the Evangelist in South Brooklyn where I lived in the 1970’s and 80’s. At last, Christo and Amelia have at least one egg! On Friday, April 20, the hawks were observed sitting low in the nest and making nest-exchanges throughout the day, indicating they are sitting on eggs. No one can see into the nest, so it's impossible to know how many eggs are in there. We have to pay attention to the hawks' behavior. The MTA unveiled a plan Monday to revolutionize the city’s struggling bus system, vowing to improve service and speed up rides by re-evaluating all 326 bus routes for potential changes, implementing things like all-door boarding and even testing out the use of double-decker buses. The MTA’s “Bus Action Plan” is the first step in the “full-scale modernization” of the city’s transit system, and looks to specifically address declining bus ridership numbers, New York City Transit President Andy Byford said. The children spent most of their days after school at the restaurant — at ages 11, 9 and 5 they’re too young to be at home alone. If they weren’t doing homework, they were watching YouTube videos of K-Pop stars and Asian dramas or running around the restaurant. For dinner, they would eat a simple steamed fish with a bowl of white rice or a fish cake soup. Often, the kids said they wanted to only eat “American” food — pizza or burgers — but their mother told them it wasn’t good for them. He tells this story early in Rohmer in Paris, his hour-long video essay on all the ways the auteur used the city in the course of his prolific, more than fifty-year-long filmmaking career. Misek describes Rohmer's characters, "always glancing at each other: on trains, on streets, in parks, in the two-way shop windows of cafes where they can see and be seen," as flâneurs, those observant strollers through the city whose type has its origins in the Paris of the 19th century. "But their walks are restricted to lunch hours and evenings out. They form detours from less leisurely trajectories: the lines of a daily commute." With ever-increasing rigor, the director "traces every step of his characters' journeys through the city with topographic precision. His characters follow actual paths through Paris, paths that can be drawn as lines on the city's map." John Grindrod used to tell friends: “I live in the last road in London.” He grew up on the fringes of the capital, in a council estate near Croydon. His parents’ 1950s house was on the edge of the estate, facing woodland which was part of London’s green belt. It was at the edge of town and country, “the outskirts of the outskirts”. He spent the first 30 years of his life in this “intermediate nowhere”, a liminal space that profoundly shaped him: “so much of my head has been formed by it, from the outskirts, looking both ways”. Growing up, Grindrod was a loner who was bullied at school, “secretly gay and obviously gay at the same time”. The green belt became a sanctuary, a place of refuge where he could be himself: “lost in my imagination, talking to the trees and hawthorn bushes and hearing their replies”. “No artist can refuse a mural,” Mychael admitted to me with a grin and a shrug, introducing the unlikely story of the origin of his vast painting, executed over six weeks in the summer of 2011. When lawyers, TV Edwards, who have been established in the East End in the vicinity of the docks since 1929, were refused permission for a large advert on the side of their building, senior partner Anthony Edwards, saw the possibility for a creative solution to the bare wall in Mile End Rd. So, after noticing Mychael Barrett’s work on a hoarding while going over Blackfriars Bridge in a taxi, he gave the artist a call. Mychael came to London from Canada in the eighties. “I was travelling around Europe and I was only supposed to stay in London for a week, but I never left,” he confessed to me. Yet Mychael’s Huguenot ancestors first came here three hundred years ago as refugees and the history of the capital has proved an enduring source of inspiration for his work. One word Boughton keeps coming back to in his account of “the rise and fall of council housing” is “decency”. It can be used romantically, he acknowledges, as a kind way of overlooking how brutal living conditions can come to brutalise those who endure them. But it also sums up his view of what, and whom, council housing is for: a sense of societal decency and fairness, in which every member enjoys comfort and safety. I'm low on early family photographs, but here's one taken in the 60s. My brother took it. Here I squat, observing my reflection in a Lancashire seaside tidal pool. I think I was seven. It's pretty much the mood of the moment too. Worth the wait at Broadway-Lafayette. I must have been there close to two hours, & some of the people were buying not just the set of five different metrocards, which given the random nature of the distribution often meant buying more, but loads extra, presumably to sell at a tidy profit. Luckily I was just behind a couple of nice people; we traded cards to help each other out. I only wanted one anyway, to round out a forty-five year span of mementos. I swapped Aladdin Sane for the Thin White Duke - the classiest looking of the five, I think, even though it represented a dark period, both musically & personally. I'd hoped there'd be a Berlin card, but this was good enough. Wiseman’s movies, which have been shot in mental institutions and on military bases, in hospitals and public parks, comprise one of the most monumental bodies of work by a single artist, but despite being awarded a lifetime-achievement Oscar in 2016, he’s remained something of a cult figure. His movies, which run as long as six hours, defy the rules of traditional theatrical distribution, and apart from a single PBS broadcast apiece, they’ve rarely been available to a mass audience. That all changed today. As of this afternoon, a whopping 40 of Wiseman’s movies—nearly everything he’s every directed—are available via the streaming service Kanopy, which can be accessed through many public libraries, universities, and other institutions of the kind Wiseman has devoted himself to exploring in his work. The maps of human and physical geography can seem overwhelming; the forces at work have become too unpredictable to be easily or neatly summarized. That’s why we need to attend to the hidden places, like the overlooked zone of anti-pedestrian cobbles and jagged paving that forms the spikescape of the modern city. And why odd little places — like a traffic island in my home city of Newcastle, cradled in the indifferent arms of grinding roads — have come to feel so important. Yet in recent years, William Blake has returned to Lambeth. Within the railway arches leading off Carlisle Lane, a large gallery of mosaics based upon his designs has been installed, evoking his fiery visions in the place where he conjured them. Ten years work by hundreds of local people have resulted in dozens of finely-wrought mosaics bringing Blake’s images into the public realm, among the warehouses and factories where they may be discovered by the passerby, just as he might have wished. Monday in Parliament: MP David Lammy criticizing the Tory government's abhorrent treatment of "Windrush" generation residents who have lived in Britain since they were children. I like to get down to the canal when there's heavy rain. I usually wear my old Hunter boots. They're over thirty-five years old. The rubber is a little thinner than it used to be, but the tread is still good & they haven't sprung a leak yet. They date back to the time before Hunter became a fashion brand; the boots were mostly worn by farmers or some of those horsey Hoorah Henry Tatler types. I was neither, but I did spend a spell of time with a lurcher dog, and later, worked with birds of prey, so life was a bit muddy. The boots I have now are actually my second pair. I gave the first ones to my mother, though I'm not sure she actually wore them much. The Hunter green back then was more of an olive colour, rather than the darker green you see in (here at least) the stores today. Mine have faded, I think (does rubber fade?). They're kind of an antique shade. I don't wear them often - I'm slightly worried that they'll finally conk out - but they're just as likely to kick the bucket in a dry closet, cooped up with the out-of-season shoes & boots, the clothes I always mean to wear some day, but hardly ever do, & the Chinese delivery raincoat I got at the 99c store. So I might as well let them have at it. There's nothing like the gleam of the streets after the rain has stopped. The woman was sitting, lost in thought, oblivious to a poem I'd glimpsed the first line of as I got on the train. I didn't get the chance to read the rest of it until I got back home & Googled it. It's a good poem to commute with. When I think of Simic it's always "Empire of Dreams" that comes back to me. It's not a poem for kids, but the ten or eleven-year-olds I worked with drank it right up as a model to write from - the book & the mask & the sideways logic of dreams. Though they couldn't know the context of Simic's poem - his childhood years in war-torn Belgrade - they knew dreams as well as any adult. Probably better. The first line of "Empire of Dreams" is seductive to a writer of any age. Try using it yourself. “One day, in a positive geyser of confidence, he gave me an account of one of these 'moving pauses'. He had a strong weakness for oxymoron. In the same way he over-indulged in gin and tonic-water. Earlier this year I started a half-assed job of trying to put thousands of old photographs in some sort of order. It's not finished yet. There's a lot of tedium involved with this sort of task, and also jolts of pleasure when pics. I'd completely forgotten about turn up. Here's a sign in the window of the Ridge Paint Hardware Co., on Third Avenue. A relic from a 20th Century Gotham. Everything about the sound of the phrase "jimmy proof locks" makes me happy. 2011. The store closed in 2015. The Mayor denies it, & trashes the News. Federal aid may be sought for the project. Chuck Schumer, a "huge fan" of the BQX, just happens to be the father of Jessica Schumer, executive director of the Friends of the BQX. This 1 year Fellowship provides an infrastructure and laboratory for emerging and underrepresented artists to gain a deeper understanding of the history of public art, incubate and present their work, collaborate with communities in shaping society, and build sustainable careers. A History of Trash in Sight” takes you through digital reconstructions of New York City public trash cans and their contents from 1930-1960. Each decade’s trash can contains a turning point about “public trash,” along with ideas about cleanliness and control that still resonate in our understanding of trash today. Take a closer look at what New York City trash was by looking through it. Click on the images of real things and listen to real sounds from the 1930s, 1940s, 1950s and 1960s. Learn what those unwanted things can show about people, power, and what it means to be a part of the public. What then does livability hold for Homo cappuccino? We can interpret the livable city as a tangible complement to platform capitalism, where the social is produced under the guise of a hygge urbanism.47 Livability appears so seductive to municipalities around the world because it promises to facilitate an atmosphere of urbanity, conveying a spontaneously unfolding everyday urban life. Such an approach is embraced as more ethical, because it is ostensibly less about maximizing returns on investment and more about appreciating the stock value of their respective cities, a docile norm conforming to the body of Homo Cappuccino. Masha Ivashintsova was born in Russia, in 1942. At 18 she started taking photographs, and became involved the underground arts movement in St. Petersburg, then known as Leningrad. She shot prolifically on the streets of the city, with either her Leica IIIc or Rolleiflex. But she never showed her work to anyone—some of it she didn’t even develop. 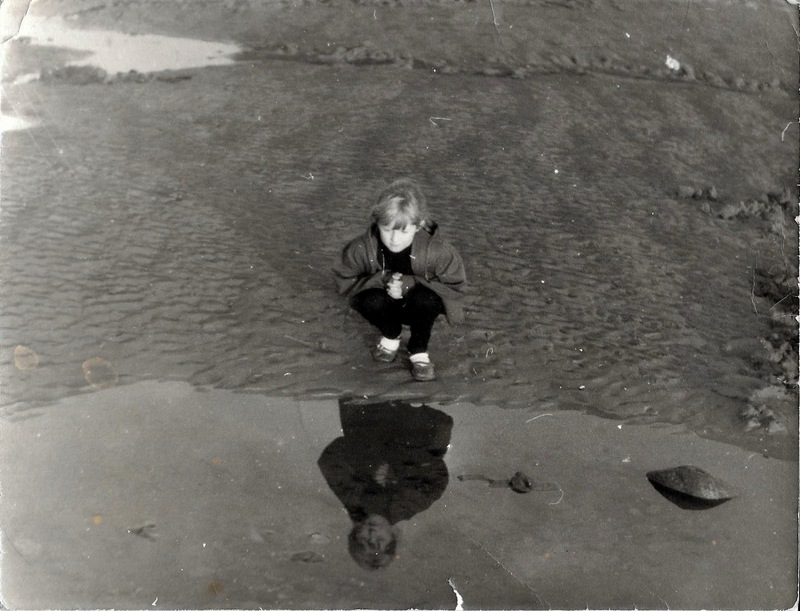 When she died, in 2000, she left 30,000 photographs—in the form of negatives and undeveloped film—in a box, where they remained, untouched, for 17 years. Late last year, while working on a renovation, Ivashintsova’s daughter Asya Ivashintsova-Melkumyan and her husband discovered the box in their attic. Slowly they began to explore this archive, and saw what Ivashintsova had seen, created, and then hidden. These vaudeville & burlesque photographs are great fun to look at. Here's Papinta, the Flame Dancer. 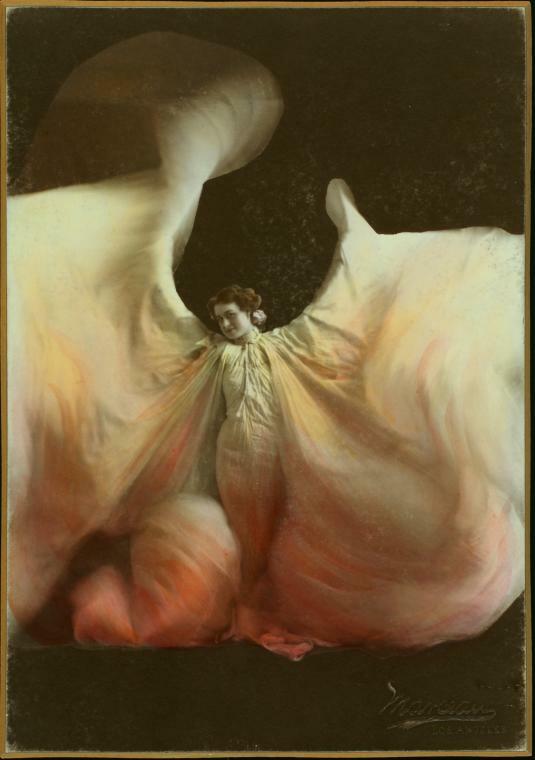 Papinta performed in the late 1800s and early 1900s. She died on stage in Germany, in 1907. Her Flame Dance was captured on film by Thomas Edison, and she danced in the first electrified stage performance in 1897. She did her own choreography, and her dances featured the use of voluminous lengths of fabric. Other dances she was known for include the Danse Serpentine, the Mirror Dance, the Dream of Light & the Study in Red. The photograph is beautifully hand colored, giving it a dreamy, painterly effect. 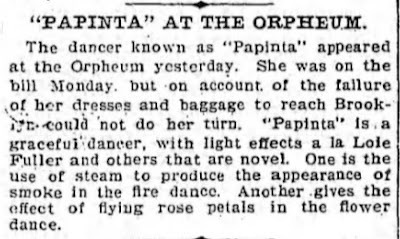 Papinta was a favorite on the New York Stage. In October of 1902, one audience must have been disappointed. Houses are sagging and leaning all over the city. Sometimes you'll be fooled by an upright facade, only to find that the inside floors & stairs are tilting like a ship on the ocean. If you live in a place like that, after a while you'll get your sea legs, and forget that it ever tilted at all. Other houses fool nobody. They could be brick. There's one near me with such a sag in the middle it looks like it's been sat on; the brickwork's cracked and the windows pitch to the center. No-one seems to care - I pointed it out to a passing firefighter once & he just shrugged. More of the leaners are wooden though; frame has a flexibility that allows it to flout gravity altogether. Wood is giving. And a row of houses can offer each other support; you'll come across a run of half a dozen holding each other up like drunks heading home from a night on the town. They may look past it, but they can still hold their liquor. With a little help. I've a fondness for frame's tenacity. Before the price of houses round here boomed, people were more inclined to live with the way their homes had settled in. Sure, they could get some extra support to hold a slide in check, but that was about it. A bit of a slump was acceptable. In affluent times, a frame that isn't even renovated can easily sell for a couple of million or more, & a full-scale gut with all the works is in order. The result is pretty but often jarring. How did a time-scarred old three-family reemerge as a Stepford wife? The funny thing is though, it's hard to get a photograph to show the full effect of a leaning building. Well, in my pictures at least. They always seem to minimize the disparate angles, as if the houses resist the camera. I've tried a bunch of times to photograph a group of wooden buildings on Sixth, but I never could capture the way they looked to the eye. I've deleted countless attempts. In March I saw that one of the group - a lounger that seemed to be resting back on its heels with its pals - was getting its exterior plumb again. It will be flush with the brick veneered building two doors over. Here's a shot taken later in the month. The light captures the angles a bit better. And here are a couple of shots from the other day, as work has moved along. Again, the angles aren't done justice here. Late Billie - 1957 - but even in frail health, the music is impeccable. Her timing is as sweet as ever, and the band is fine & mellow. Look at Billie's reactions to those solos. She wrote the song, & recorded it in 1939. You can hear a '39 recording here, & compare the two. They're both great, but this later one is sublime, about as raw & loose a version as you can get. Hard living and musical genius make magic. The '57 recording is from a TV special, The Sound of Jazz. Here's the line up of the band - jazz royalty. The first six are listed in order of their solos. That didn't take long. At the end of 2015, 555 Fifth, the handsome corner building at Fifth & 15th, was sold for $5.25M. The several small businesses that occupied the space were displaced and the building underwent a lengthy renovation. A Crunch gym opened last year, occupying the basement, the upper floor, and part of the first floor. A Sherwin-Williams paint store opened earlier this year in another of the ground floor spaces. The third ground floor space is still up for lease. 555 is now back on the market for $27M, with the marketing touting its air rights, upcoming tax abatement, prime location, and in-place tenants. And talking of tenants, the marketing brochure lets us see what rents they're paying. Crunch has a fifteen-year lease, increasingly incrementally from its current yearly rate of $750,000 per year to just under $1M in 2032. Sherwin-Williams has a ten-year lease - $300,000 in years 1-5, and $336,000 in years 6-10. That's a lot of memberships and cans of paint to sell. Is there any chance of the owners getting this sky-high price for the building? Retail vacancies abound throughout the city, and in Manhattan at least, both retail rents and property sales have started to soften. I've no idea how pricing works, but this one appears unrealistic. Various earlier posts on 555 include this one, with some links back. Some drama at Chase the other Sunday. There was a turf war of sorts as Connie arrived to find a man in a wheelchair asleep in the bank, spoiling her regular weekend panhandling routine. Well, I think he was asleep; perhaps he was keeping his head down to try and stay out of trouble. Connie berated the quasi-slumbering figure. "You can't stay in here. You have to leave! I can't talk with you here - there are things I say to people!" Connie does have a great line in sassy repartee, along with a repertoire of flattery and tart insults. It's just about the wittiest talk on Fifth, an avenue hardly known for bons mots. I stayed out of the stand-off, and left with the situation unresolved. I knew who'd win though. I felt a little sorry for the guy in the wheelchair. It was a cold day, and you could hardly blame him for seeking shelter. But Connie had a point - this was her Sunday salon, and this was business. Connie has a loyal group of followers who pop in to use the ATM & slip her a dollar or two, or more. Many, like me, will drop in anyway, whether we need to take out money or not. I like a quick chat, and I like to watch her in action. Still stylish in her seventies, she's tough, and smart & impossibly funny. No-one works the customers as well as she does, and no-one leaves them in such good spirits. It's an art. I'll admit it - I fall for the game always. I'm in her thrall. I always enjoy the views at Hamilton Plaza - all part of that Hamilton to Smith Street infrastructure overload. A visual assault. The bridge was up yesterday, and the push tug Sarah Ann was lined up right in front of the open fence. A fine sight. Just why the fence is left open is a good question, but it's good luck for me. I thought of going beyond its edge to get a better view, and I tested the bank with a cautious foot, but the ground was spongy. And I've learned my lesson here. I used to like to hang out at the bottom of the Lowe's parking lot, right about where a section of the bulkhead fell in the canal last May. I still shudder when I go by there. I suppose it might be poetic, but I've no desire to end my days in the dark waters.